Hafokh is the term used to order the incomparably delicious Israeli-style coffee latte we had only a few weeks ago. Hofokh is also the term many Israelis use to speak of their current lives and politics. Hofokh is how my heart, mind and spirit feel after returning from Israel to America. In Torah, as a word, hafokh hardly happens (hmm, sounds like a line from My Fair Lady). Hofokh appears as the root term for when G-d shifts the winds and blows the locusts into the sea, ending that plague when Pharaoh initially recants. The root hafokh appears again, a bit later, when Pharaoh's attitude shifts back and he comes chasing after the Israelites as they are crossing that very same sea. That time hafokh also happens, as the waves drown the pursuing Egyptians. Yes, the Ruakh HaKodesh, Life's Winds, blew us to Israel for a month and then immediately, I went off to teach in Arizona. Barry stayed in Philly for the next phase of launching of his first book, "Communication Skills that Heal: Toward a New Professionalism for Medicine," via a Public Radio interview. Now we're back in Philly, and this is written as we are delighting in Pesach and pondering, where and how a Jew is meant to live. Both in Arizona and Israel, very different kinds of exquisite deserts are in full bloom. "Stamen!" shriek the brilliant colors of each desert flower as they extend passionate welcomes. Or, as my Hubbatzin Barry's extensive world-wide South African family and friends say wherever and whenever we land at their sides, "Hey, don't be stupid, stay man!" Stay? It sure was intensely difficult to leave Israel. I, for one, feel like the middle matzah from the seder plate --- one half of my soul here in the Diaspora, and somewhat "out of order (seder)" from already yearning for the experience of completion as a Jew I felt so strongly this time in Israel. Perhaps Israel is the afikomen, and it takes all of Diaspora Jewry to make up the other half? Last time I visited Israel the population was about 3 million, today it is over six million, 2 million under age 18 - the streets and parks are vibrant with young families. -A high school teacher helped us up the smooth stone banks of the wadi. We walked along together as he explained the crucial importance of such field trips so that every Israeli child knows and respects the land. He asks Barry and I where we're from and what we do. Upon hearing I'm a rabbi, he says, "I was raised religious but I'm not anymore, it doesn't speak to me." So Barry replies, "I've reconnected through the story of Moses at the burning bush, by reading Ehyeh asher Ehyeh not as "I am that I am" but as "I am becoming what I am Becoming," or "I will be what I will be," I experience the idea of God as role modeling for us the concept of self as constantly evolving and not being a fixity. We are all "becoming what we are becoming," like your students, like yourself, like Israel." The teacher stops in his tracks, tells us his parents were born in Morocco, and he never heard this wonderful interpretation from them or in school. As a native Hebrew speaker, he muses, ?Why didn't I see this before! Is there more of this approach I can learn?" 21-25% of Jewish Israelis call themselves Orthodox, the hunger among the rest for accessible, meaningful Judaism proved during our visit to be as thirsty as the land. Most don't know an alternative with integrity is even possible. 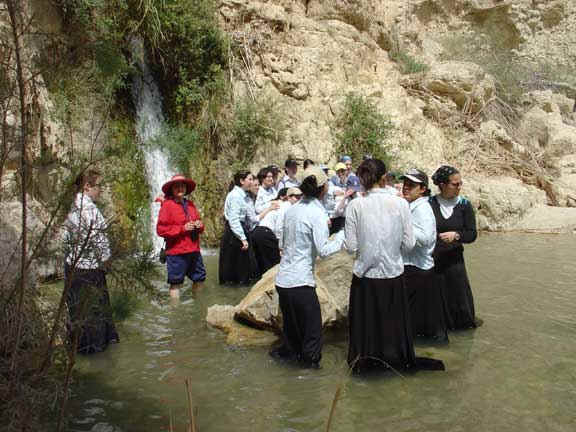 Soothing rivulets bathe our hot feet as we walked upstream towards a plateau that will overlook the Dead Sea. Yours truly is wearing a red hat and a red long sleeve sun repellent shirt, pants rolled up over calves. I frolicked beside a pool filled with girls in long sleeved pale blue shirts and long black skirts and black stockings, all soaked to the knees, having the time of their lives. "What do you do in America?" one such girl asks me, "Ani rav." "I'm a rabbi." "You mean you make shidduchim (matches)," gently, she corrects me. She's in for a surprise. "No I am an actual rabbi, for weddings, gittin (divorce documents), teaching, prayer, counseling, answering shaylas (religious questions) and such." We walk along silently, navigating rolling dry rocks under a relentless sun blessedly tempered by a sweet spring breeze. Perhaps 15 years of age, she keeps turning as though to eye my huge red hat with curiosity and finally inquires: "In America are there now red hat hareidim (ultra-orthodox Jews) and women rabbis?" I chortle, "No, even in America a hareidi women can't yet be a rabbi, I'm from one of the more liberal Jewish groups. Are you hareidi?" She laughs and calls out to her classmates a few yards ahead, "The American thinks we are hareidi! No, we are modern Orthodox from Ashkelon! We wear light blue shirts. Don't you know?" French Jewish tourists were prominent during our visit, some recounting brushes with anti-Semitism; many were buying apartments as ?insurance?. Tourism is up 70% in Israel over last year, those we met told us "we no longer feel safe in Moscow, Paris, New York City, or Madrid, so why avoid Israel?" This time we didn't want to go on yet another Israel mission to learn or listen - left, right or center - this time we wanted to look, listen and feel all on our own. The trip was actually instigated by my father, Sam Milgram, who, at age 86, is an alert, radiant-with-wonder wheelchair-dwelling World War II veteran who never wants anything for himself. Poppa has, for ever-so-many years, been primary care-taker for my mom who has Alzheimer's. In January, when mom ceased to recognize any of us, dad astonished us by saying: "Now that your mom doesn't know me, before I die, the one thing I want to do is finally experience Israel." What a gift, to hear a parent's deepest wishes and to be able to fulfill it. We leapt into action, with an 86 year-old, waiting wouldn't be prudent. Besides, we'd been yearning to go back, I hadn't been for 18 years --- mostly out of shame and ambivalence, Barry not for 14, and we've certainly been every where else! A good bit of research yielded a driver with an accessible van and electrified scooter-type wheelchair accustomed to locating accessible bathrooms, entrances and sidewalk ramps throughout the country. Did you ever take a young child to Disney Land? You can't do that happily if you go with adult judgementalism, so too, we who have been many times to Israel, suspended that part of ourselves and experienced Israel through my dad's eyes. In the Meaning and Mitzvah conference call courses I've been teaching, our studies yielded the realization that the mitzvot of ahavat HaShem [love of G-d] and yirat HaShem [awe of G-d] together form a Möbius strip of higher consciousness when one begins to understand and practice them. In just this way through Dad's eyes Israel came alive anew for me, as though G-d is the glassblower and in our hands --- yours, mine, and especially the Israelis --- has been placed the tender and infinitely challenging mitzvah of continuing to create a gem in the diadem of creation, Israel. Pappa was with the signal corps during World War II, his unit had the first portable radar used in a war. They were given coordinates to reach in order to transmit. Then they were given coordinates for three days furlough. When they reached those coordinates it was a town, stunned by the human skeletons piled high and similar ones staggering through the streets, my dad didn't see the truck coming with its German driver that would crush his lower body against a wall. I never heard the true story of his injury until this trip; he'd always sloughed off our questions. In every hotel lobby I would find him late at night chatting with the omnipresent security people, some who themselves had been wounded in action. For a moment I was irritated that dad might miss a tourist site because of all the talk, then I listened in and realized they were healing each other, by retelling and commiserating about what they wouldn't or couldn't have told their families. Imagine Poppa, with the memory of the walking skeletons of Auschwitz engraved on his very body, arriving to imbibe a heady new brew, history hafokh - millions of Jews of greatly varied backgrounds and vociferous opinions dwelling surprisingly coherently in a space somewhat smaller than New Jersey. For two weeks Dad was with us, rolling along joyfully, other times nodding off, and, when necessary for access, using a walker. While we would stay on to teach and be most shifted by visiting family, friends, students and colleagues throughout the land, with dad we had a scenic tour of most every bathroom and many a stunning view of nature and the density of fascinating and well-interpreted archaeological residue from the regions many sequential empires. While Dad was with us in Jerusalem, there was one glitch, all of a sudden he popped a wheelie. My heart about stopped. He had revved up his wheelchair on a downward sloping sidewalk, come to the lip of the curb and playfully just kept going. Fwoop, he rounded up into the air and then landed splat, utterly hafokh (tush over teacups as some say) in the street. Israelis came running to help him from every direction, even taxi drivers leapt from their vehicles to make sure he was ok. Dad just dusted himself off, popped back into his seat and said, "Thanks! Just needed to try that once." You see, he had never before accepted the use of a wheelchair, preferring to stick primarily to the kitchen at home. He sure was giving it a hefty test drive! Two of Pappa's best buddies flew one of Israel's four planes in the war for independence. We learned at Israel's Air Force Museum that the trick was how the Israelis kept repainting the planes different colors to make it look like there were many planes. They also learned to put whistles in soda bottles and drop them without explosives --- the sound resembling bombs caused those below to scatter. Israel did build its own fighter jet in recent years, but it turned out to be too expensive to sustain. One hears fear creep in as the docent says this; to be dependent on the nations has proven dangerous for us. History hafokh, only for real. Our people have dreamt about it, chapter nine of the playful novel turned sacred text, Megillat Esther is one other place to find a few instances of forms of hafokh, when the rite of reversal has happened, and the Jews take office, marry royalty, and are allowed to defend themselves by royal decree no less. Megillah reading at Reform congregation Kol HaNeshamah. The reader is a black-hatted male Hassid, oops, no actually he's a woman. The room is packed with those fulfilling the mitzvah of hearing the megillah chanted. The day before we danced in our masks from New Orleans at a party at Rabbi Ruth and Michael Gan-Kagan's. Next day, Barry heads through the extensive security points into Jerusalem's Ben Yehuda Street which has been turned into a spectacle of color, music, entertainment, smiles. Israel's every immigrant group is out in celebration --- Ethiopian, South American, Moroccan, Yemenite, Russian and more. Perhaps the most engaging for me is the troupe of Druze musicians and dancers with their shrill ear-piercing flute-like instrument, rhythmic drumming and hypnotizing folk dancing. I feel totally safe here. (More from Barry in the next travelogue). Barry's pix from Purim reveal the intense diversity of this society --- a true ingathering of our people from every society. As it happens, I find an internet café and no sooner set up to get on line then the security guard a few feet from where I am seated near the door leaps to his feet, grabbing the hands of a man. In seconds on the ground are the man's jacket and a vest so heavy the guard can barely lift it. The guard from the café across the street comes running, waiters herd patrons out a side door and the last thing I hear at the scene is a girl, about five years old asking her mother in Hebrew "Ima, does it hurt to be blown to bits and will a kiss make it better?" Mah laasote (what to do)? Accept with the equanimity of those around me that these things happen and walk down a block to the next café and unsuccessfully try to get online again. The fellow to my right says, "Say, did you give a lecture at the neo-Hassidism conference in NYC two years ago?" Actually, yes. The fellow on my left says, remember, we met in Kiev going through customs? Also yes, a Project Kesher trip. Israelis we meet are relieved the murders in the Jericho prison were apprehended before Hamas could fulfill their intent to release them once international surveillance would leave later in the week. It's all so odd to me, 18 years ago I slept over, hosted by an Arab family in Jericho, ate fragrant grapefruit-like huge palmelas there, visited the archaeology. No more an option. Now Jericho is known for casinos. At Abu Gosht an Israeli Arab restaurant proprietor tells me how thrilled he is the Israelis have razed the Jericho prison, "Will likely increase my Palestinian family's investment in the casino business many-fold if the prison is really gone." Perhaps what hofokh really means is, "shift happens." Ben Bag Bag in the Talmud said: hafokh ba, v? 'afokh ba d?kula ba. Turn it (Torah) and turn it for everything is in it. As the scroll turns, these days Egypt advertises heavily for tourism in the Israeli press and even on billboards in Israel. Even a cool peace, is good. Let's pray for more. We'll try to write another travelogue to cover the second half of our trip and introduce you to the wide range of family, colleagues, friends and characters we met. Rabbi Goldie Milgram is director of ReclaimingJudaism, author of "Reclaiming Judaism as a Spiritual Practice: Holy Days and Shabbat", "Meaning and Mitzvah: Daily Practices for Reclaiming Judaism through Prayer, God, Torah, Hebrew, Mitzvot and Peoplehood" and "Make Your Own Bar/Bat Mitzvah: A Personal Guide to Creating a Meaningful Rite of Passage" and editor of Bar/Bat Mitzvah Institute Initiative E-Magazine.